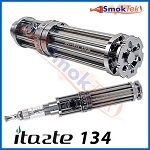 The iTaste 134 is a massive, exceptionally well built Variable Wattage device. Its design is striking and truly unique - you will stand out anywhere you go with this singular mod! Wattage is adjustable by spinning the easy-to-read rotational wheel. The battery level indicator feature on this device will alert users to battery capacity by flashing green, yellow and red LED lights (Green = Fully Charged, Yellow = Half Discharged and Red = Charge Needed.) These features offer more intuitive control and ensure accurate performance. The iTaste 134 has a 510/eGo threaded connector, which allows the use of a variety of low and high resistance accessories. The iTaste 134 also comes with an instructional manual, a carry case, a removable beauty ring and one iClear30 clearomizer. 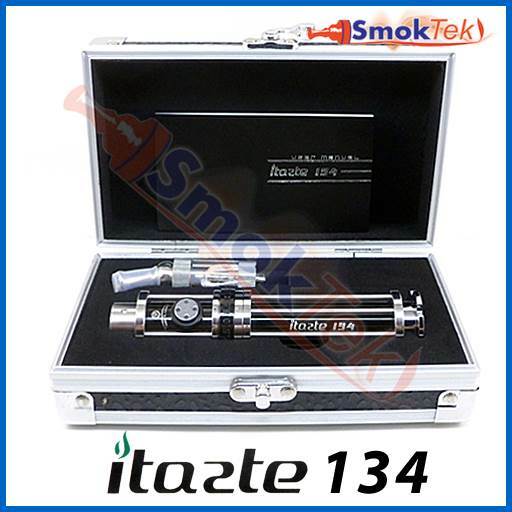 The iTaste 134 uses a single 18650 IMR battery (available separately and discounted when you make it a kit). It will work with flat OR button top IMR batteries (no more than 66mm long). 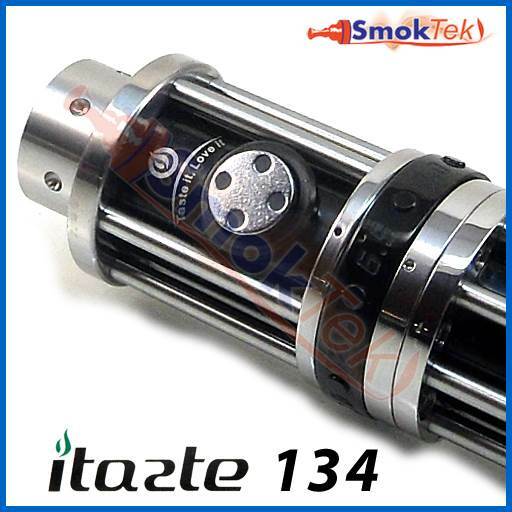 The iTaste 134 will not work with 2 stacked batteries - using 2 stacked batteries can damage the device. I was very pleased with the help received however as for the product...not so much. The first unit I received seemed to have a fault concerning igniting the element. When you press the button it does not heat up immediately. Instead you need to do a two count prior to drawing on the tank. Once up to temp it delivers a descent puff however because of the special needs it does not satisfy me. 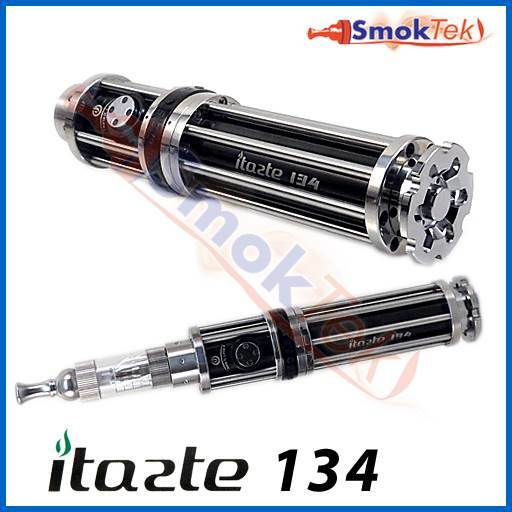 Besides I use a similar Itaste product (CLK 1280) and it blows away the 134. When I told the shop about it they provided a replacement immediately however the fault must be standard with this unit because the new one did exactly the same. Very disappointed in the product however pleased with the shop and the support I received. Would I buy it again or recommend it...not a chance however I would highly recommend Smoketek. Definitely not for someone who prefers a small and lite PV to keep in their shirt pocket. Even the battery end cap weighs a ton! The fire button works well without any annoying "clicking". There is no voltage read-out or screen. You only have a mechanical wattage dial about halfway down the stick. I prefer a higher wattage but avoid going all the way to 12.5 (the max) as it burns through coils. I honestly don't miss the digital screen or the voltage deal (just one more thing to break or go on the fritz). Only negative so far is that the markings on the wattage wheel are not highlighted so they are very hard to see unless you are outside on a sunny day. Other than that it's a thumbs up from me.